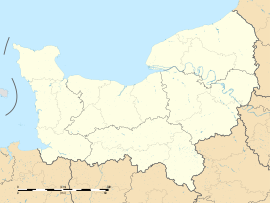 Saint-Martin-de-Varengeville is a commune in the Seine-Maritime department in the Normandy region in northern France. 4 The church of St. Martin, dating from the nineteenth century. A small town of forestry, farming and a little light industry situated by the banks of the Seine, some 7 miles (11 km) northwest of Rouen at the junction of the D90, D43 and the D86 roads. The church of St. Martin, dating from the nineteenth century. The chapel of St. Gilles, dating from the seventeenth century. The nineteenth-century chateau Le Breton. The chapel of St. Anne. Traces of an ancient castle. Wikimedia Commons has media related to Saint-Pierre-de-Varengeville. This page was last edited on 30 May 2018, at 09:08 (UTC).